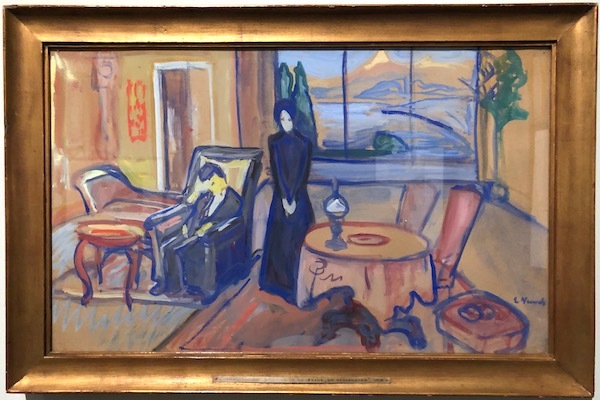 A new exhibition of work by the Norwegian artist Edvard Munch now at the British Museum claims to be the biggest ever devoted to his work here in Britain for 20 years. Be that as it may, it certainly isn’t entirely comprehensive, not just because it focuses on his graphic work and more or less leaves out his paintings (though there are one or two), but also because it focuses on the earlier part of his career as a printmaker. In this field of art, Munch was hugely productive, though also repetitive, making numerous variants of a basic idea. He was also, in contrast to this, an adventurous user of different print-making processes, often combining a number of varying techniques. So when creating a single image. Similarly, he rarely made fixed editions and often printed an image in a slightly different way on different occasions. The BM show, held in a constricted space, struggles to deal with this. There are moments when it tends to look cluttered. You can’t stand far enough away to give the image you are looking at the room to breathe. This said it is however accompanied by a very fully illustrated hard-cover book published by Thames & Hudson, with excellent essays on various aspects of Munch’s activity as a print-maker. One feature of the book is a lengthy interview with Karl Ove Knausgaard, the current Norwegian author du jour, conducted by the curator of the show, Giulia Bartrum. In this Knausgaard states that Munch’s work claims responses that are very specifically non-literary, nothing to do with words. You have to look at the prints themselves and allow the images to communicate with you directly. He is pretty certainly right. If you have to choose between the catalogue and the exhibition, choose the show. There are historical reasons for making this choice. The artist’s print, as we now know, it was, despite the efforts of such major predecessors as Durer and Rembrandt, really very much a product of the late 19th/early 20th century. It ceased to be a purely populist product and addresses itself instead to the members of a cultivated bourgeoisie. Prints were made to be possessed. They offered evidence that their possessors were what would now be called ‘woke’. Not just aware of the artistic currents of their time but wanting to be fully part of them. Munch was very much of a hero figure in a just-pre-World War I bohemia, which had a fully international existence. His native Norway was trying to achieve a distinctive voice in the arts, and using it to speak to and to be internationally influential within, cultural entities much larger than itself. Munch’s career was part of this effort. He travelled restlessly, and his work had a particular impact in Germany. The catalogue of the BM show compares him to his older Norwegian contemporary, the playwright Henrik Ibsen (1828-1906), self-exiled to Germany in 1868, and hugely influential internationally. Ibsen, by then a cultural hero, returned to live in Norway in 1891. A biography of Ibsen now on the web describes him as having become “a tourist attraction of sorts” in Christiana (now Oslo). Much the same fate was to befall Munch in later life. When one looks at the show at the British Museum, one’s struck both by the fact that the images are indeed as emotionally direct as Knausgaard claims them to be, but also that time is slipping away from them. 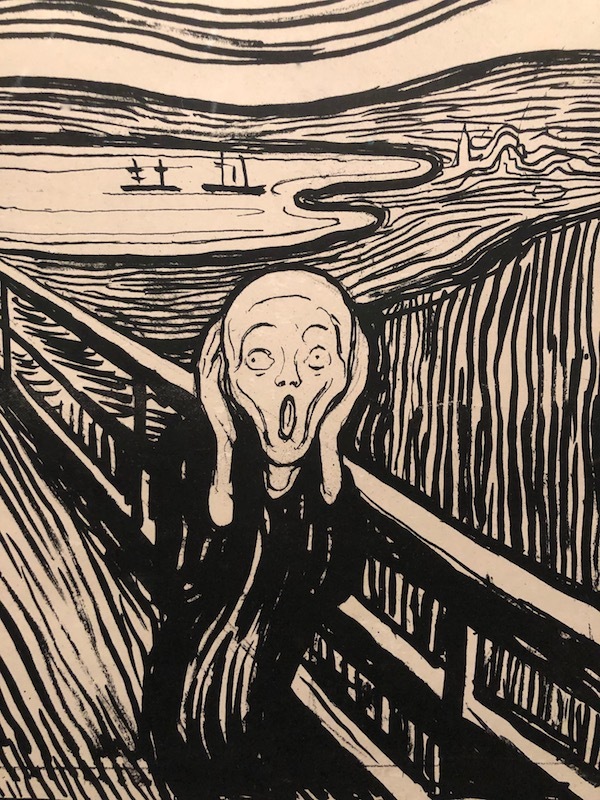 The exception to this is the cover image for the T&H book, The Scream, which even exists in a number of painted versions. This expresses a sense of horror, desolation, isolation which seems very relevant. So much so, that it has some claim to be the most famous artistic image that now exists: a universal icon. This is not the case with a majority of the other images, which are about women and male/female relationships. Munch, who spent the early part of his career in a roiling international bohemia, never formed a stable relationship with a partner. His women are tragic figures, but also essentially aliens. One couple is bound together by strands of the woman’s long hair. When couples are depicted, they quite often gave their back to us, so that we don’t see their faces. In another print, entitled Desire, three huge male heads loom over a flat-on-her-back female figure. The old saying has it that “the past is another country”. In terms of sexuality, that is certainly true here.